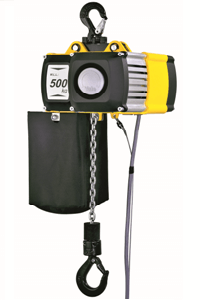 The Lodestar electric hoist has an excellent reputation within many industries where long lifting heights are required along with high duty ratings. Up to 3000kg SWL. A rugged little hoist with a proven reputation. 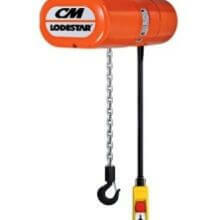 The CM Lodestar chain hoist is commonly utilised in factories on production lines. 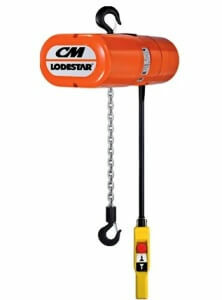 The Lodestar chain hoist is directly available from Lifting Hoists Direct at very competitive (often unbeaten) prices. With our excellent aftercare support to offer including breakdowns, servicing, repairs and inspections we supply all your hoisting needs in one place. 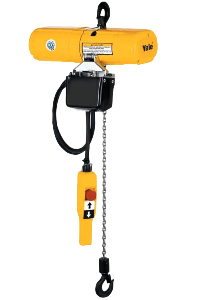 Take a look at the key features of the durable Lodestar chain hoist and contact our team for a quick quotation. 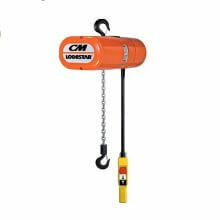 Available with WLL up to 3000kg the CM Lodestar has many features for a compact hoist. The aluminium alloy cover totally encases the working parts and therefore offers great protection from foreign objects, damaging the mechanics of the hoist and dirt ingress. The aluminium cover also makes this a lightweight electric hoist when compared to others. This housing also provides great heat dissipation. A further benefit from the simplistic design of this hoist is that there is easy access for servicing and installations. The standard operating voltages for a lodestar hoist are: 110v 1ph 50Hz; 230v 1ph 50Hz, and 400v 3ph 50Hz. They have standard operating temperatures ranging from -10 up to +65 degrees. Thermal overload protection comes as standard. The Lodestar chain hoist also comes complete with adjustable upper and lower limit switches. 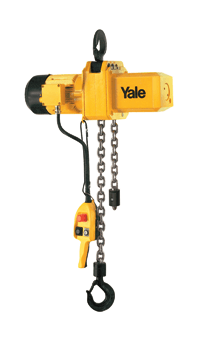 These limit switches offer higher safety levels and longevity of the hoist. The rather exceptional servicing and maintenance properties of the Lodestar are in part down to the lifetime lubricated gearbox. The motors within the lodestar chain hoist are 3 phase and single speed motors and are dual voltage. FEM classification is 2m (50% duty - 30 minutes continual use each hour) motor classification is H4. The load hook has an axial bearing and is ideal for long heights of lift, we can supply any length of chain. We can supply a range of chain containers to safely store chain out of the way, they are available in 5 different sizes to suit chain lengths up to 120 metres. There are new styled weatherproof rain jackets which are a great addition to your CM Lodestar if you will be using it outdoors; raincoats are also available for optional beam trolleys too.